The FDA joined the Cross Government Women’s Network in a celebration of the Suffrage Centenary on 13 December. The event, held at the Department for International Development, marked a century of votes for “some women and all men” while also looking at the past, present and future of women in public service. The afternoon was filled with screenings, speeches and even song, as civil service choir Etcetera took to the stage and Claire Eddington performed the Pankhurst Anthem. 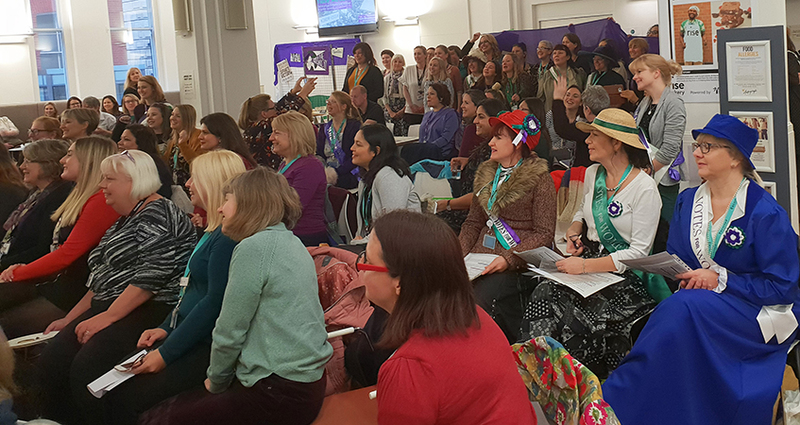 Attendees in full period costume told the stories of the individuals who fought for female suffrage, such as the first woman MP Countess Constance Markievicz, and delegates fashioned suffragette and suffragist rosettes. Volunteer Ellie Binks gave a presentation on the 2018 suffrage flag relay, which saw the flag travel all over the UK and across the globe before reaching its final destination: parliament. One live blogger travelled from Iraq to speak to the audience, another interviewed her grandmother, and a third presented a video where she, her mother and her pre-teen daughter spoke about their experiences as women and girls. Minister Harriet Baldwin addressed the room. DfID Permanent Secretary Matthew Rycroft, who could not attend, sent a video message. Keela Shackell-Smith, leader of the Cross Government Suffrage Centenary, pointed out that 1918 did not see universal suffrage for women – that would not happen until 2028. “But this means we can celebrate again in ten years,” she explained, and delegates were invited to contribute to a 2028 time capsule. FDA National Officer Victoria Taylor, the union’s lead on women’s workplace issues, spoke about the gender pay gap and the practical steps an individual can take to combat it. She advised delegates to talk to colleagues, to ask employers about the pay gap and to join their union. Taylor said: "It was an honour to be asked to join the final celebration of what has been an incredible year. The work that Keela, Ellie, Siobhan and the team of volunteers have done to bring stories to life and ensure this important piece of our history is remembered has been nothing short of phenomenal. Talking about Equal Pay is something that I do as part of my day job, but speaking to a room of such enthusiastic, positive public servants about an issue that can have a huge issue on their day-to-day lives was a pleasure. I'm looking forward to the celebrations for full suffrage in 2028!" Bernice Allport, Chair of the Cross Government Menopause Working Group, spoke about the menopause, how it affects “home family” and “work family”, and the need to both provide practical support to women going through it and an environment where people are able to discuss what they are experiencing. Jason Ghaboos, who is currently on secondment to Murray Edwards College Cambridge, talked about the need to engage men in the fight for equal rights. Finally a:gender’s Gemma Kensey underscored the need to support gender equality and gender inclusivity, focusing on transgender, non-binary and intersex staff across Government. “There is too much emphasis on what we are rather than who we are,” she said, explaining the real need to address the danger and discrimination facing individuals: one in three employers are less likely to give a job to a trans person and one in eight trans employees have been physically attacked by a colleague of customer. Kensey explained how awareness training and policy advice are two tools a:gender offers that can improve workplaces. The FDA sponsored the event by providing lunch, and held a stall throughout the afternoon. Staff members spoke to delegates about the Women’s Network and how union membership can help pave the way to true equality.